Pooja is an Associate Coordinator at Pravah working on 'My Life, Mere Faisle, a programme that enables adolescents and youth to have agency over their own lives and bodies and change unequal norms vis-a-vis gender and other identity-based exclusions in an intersectional, youth development approach. She is also a teacher-facilitator for the 'Plan-It girls' programme to build gender-inclusive classrooms in Delhi's government schools. She has facilitated sessions on identity, patriarchy, leadership, victim-blaming and the importance of sisterhood with school-going girls for The Gender Lab. Pooja was formerly the Programme Supervisor of Pravah International Citizenship Service, she worked on the ground in rural regions of Rajasthan for a year and led a cross-cultural team in staying as well as working with the community to address issues of gender and caste inequalities and access to water, health, education and government welfare schemes. Pooja wants to focus her work on forced and child marriage. 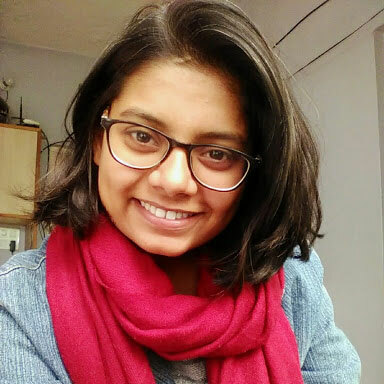 Pooja aims to build knowledge on intersectional feminism, systems of oppression, systemic inequalities and use her network to advocate for these issues. "Thousands of women have struggled before me to bring me and the women of my generation to where we are at present and I feel responsible to continue the work towards the world where women and girls have full agency over their own lives and bodies, where they can reach the maximum potential and fulfil their aspirations as well as support others to do the same. In a society where women and girls still face a lot of conflicts in making choices about their education, careers, marriage and more, a global political movement (SheDecides) towards a world where women and girls decide about their bodies, lives and futures is not only relevant and required but it is a matter of urgency. And this is not just for women but is necessary for strong and equal communities across the world. This selection will provide me with an opportunity to demonstrate what I work on and advocate for it. I believe that there is a strong need to invest in young people, especially women and girls, to enable them to have agency and be empowered to collaboratively work towards shifting unequal and unjust normative narratives."